Need an easy but impressive side dish for entertaining? 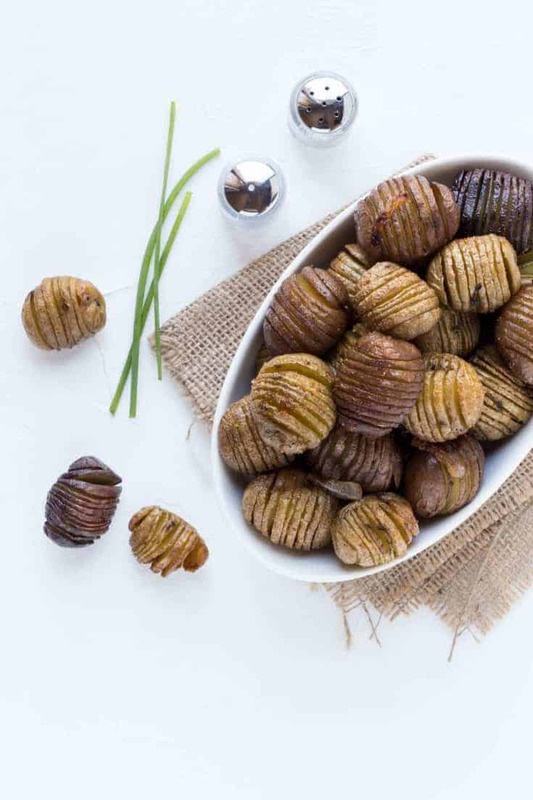 These Brown Butter Hasselback Potatoes are just what your next gathering needs! Calling all brown butter fans! Just say no to plain roasted potatoes. These Brown Butter Hasselback Potatoes are going to be your new go-to side dish. Are you on the brown butter wagon? If not, you need to jump on. The flavor that brown butter has cannot be duplicated. It is the perfect way to take any dish to a new level. But like all recipes that have few ingredients, make sure the ingredients you use are high quality. So that’s why we don’t use just any butter. 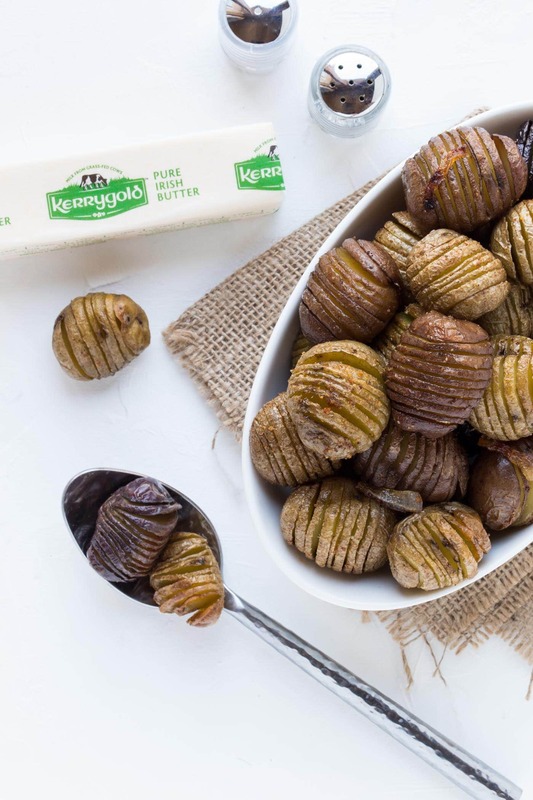 We choose to use Kerrygold butter on these mouthwatering potatoes. One bite and you will be hooked. When you brown the butter, the flavor is rich and nutty. It’s like liquid gold in a pan. Brown butter sounds fancy but is SO easy to make. Even people who don’t like to cook can brown butter. I know you are thinking; sure, browning the butter is easy, but it’s going to take forever to slice the potatoes like that! Hasselback Potatoes used to intimidate. me. I love how they look but thought that slicing the potatoes would be a pain. But with this easy chopstick hack, the potatoes are ready to go in no time! Simply place a pair of wooden chopsticks on a cutting board and place 3 potatoes between them. Using a sharp knife, cut potatoes into thin slices. The chopsticks will prevent the knife from slicing all the way through the potato. Repeat process with all of the potatoes. Boom. Hasselback potatoes made easy! Make-Ahead Tip: Bake these potatoes earlier in the day and refrigerate. Reserve 2 tablespoons of brown butter. Toss potatoes with the reserved brown butter after reheating. Preheat oven to 400 degrees. Line a rimmed baking sheet with foil and set aside. Place butter in small pan over medium heat and cook for 2-3 minutes or until brown bits form on bottom of pan. Make sure to swirl the pan to prevent burning. Remove from heat and set aside. Place chopsticks on cutting board. Place potato between chopsticks and make thin slices. (The chopsticks will prevent the knife from going all the way through the potato). Repeat with remaining potatoes. Place sliced potatoes, red onion and garlic cloves on baking sheet. Pour 3 tablespoons brown butter over top and toss to coat. Season with salt and pepper. Bake in preheated oven for 30 minutes. Baste potatoes with additional 3 tablespoons brown butter and bake for 25 minutes or until cooked to desired doneness. Toss with remaining 2 tablespoons of brown butter and serve. Garnish with chives if desired.